Inspired by the iconic King Arthur, Quickspin’s creation of Mighty Arthur offers a completely fresh outlook on the classic story. Set in the heart of the forest, the king and members of his court gather together for important business. This game has 5x3 setup and 20 active pay-lines that you can activate for each individual spin. Just like most Quickspin creations, Mighty Arthur has a delightful design combined with exciting bonus features, such as: Arthur Expanding Symbol, Random Merlin Wilds and a Free Spins Bonus. 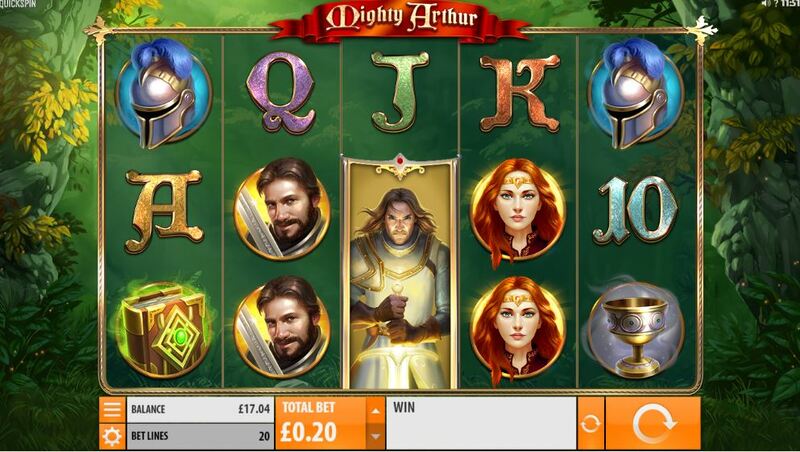 Join King Arthur on a quest to slots online glory! Join and spin today in these amazing slot games! 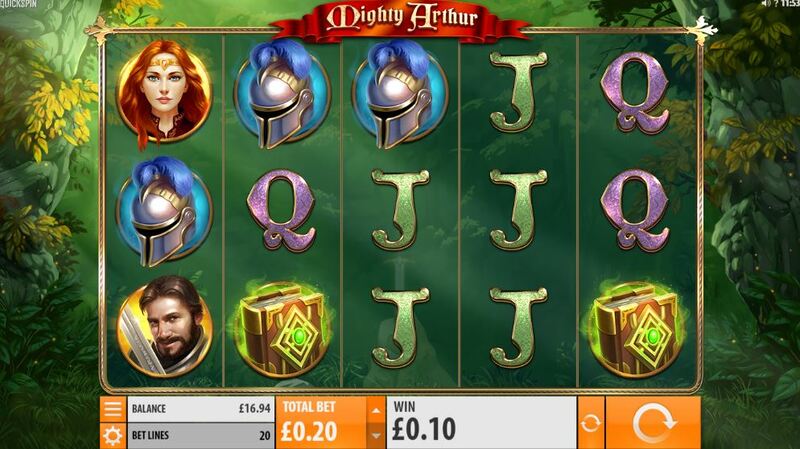 The background music of Mighty Arthur gives you a sense of purpose as you head into real money spins. As you start spinning you’ll soon realise that different symbols return different cash prizes. The symbols that will appear the most and will ultimately pay low, are the playing cards ranging from ten to ace. But don’t worry, there are some medium to high value symbols that give you a chance to win big, such as: Goblet, helmet, magic book, the king, Lady Guinevere and a standard wild. * ARTHUR EXPANDING SYMBOL – This symbol will only appear on reel 3 and is a 3x1 WILD. Once appearing on reel 3, it turns the adjacent reels into wilds as well. * RANDOM MERLIN WILDS – This WILD will appear randomly on the reels and is a 3x1 WILD. Unlike the Arthur Expanding Symbol, this wild can appear on any of the 5 reels in the base game and free spins bonus. In addition, it generates a further 2 to 6 wilds that are randomly placed onto the reels. * FREE SPINS BONUS – You can trigger the Free Spins BONUS by hitting 3 bonus SCATTERS on reels 1, 3 and 5. Once you trigger the bonus, you’ll receive 10 free spins. Classic stories have been made into video slots before and have been disappointing, but Mighty Arthur isn’t one of those. The captivating theme and slick design shows just how much detail Quickspin put into their creations.